Step 1: Start the iChain Management http://youriChain:1959/appliance/config.html. Step 2: Select the “Home-Certificate Maintenance” panel. Step 3: Select “Create” to create the CSR. 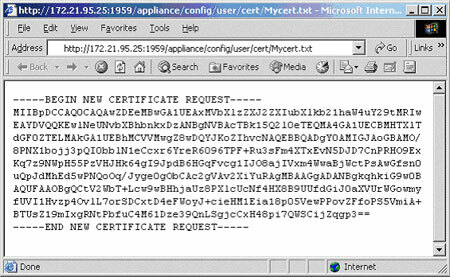 Certificate name – Any alphanumeric name as long as it is unique. 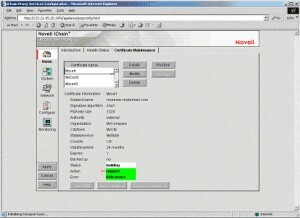 Subject name – The DNS name of the site that is to be secured. Signature algorithm – can be SHA or MD5. RSA Key size – use 1024 bits. Select ‘Use external certificate authority’. Organization – The company that owns the web site. Note: Entering spaces may cause problems. City, State or Province code and two character country code. Step 4: Select “Apply” to generate the CSR. When it is ready the Status will indicate “CSR in Progress”. Still have questions? Contact our support team now!